Though Nairobi may be the bigger city, that doesn't mean it's the only place to stay in Kenya. Mombasa is down south and right on the coast. The city is the main hub to the popular tropical beaches, but is also interesting in it’s own right. The coast region is home of the world famous Swahili culture, and many historical towns and ruins tell of the rich history of trade with and invasions by many Arab and European peoples. 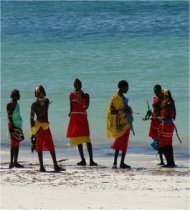 When traveling to Kenya, Mombasa really should be on your agenda. Mombasa city is mainly on an island, but also spills out onto the mainland. The north coast is connected to Mombasa by a bridge, and the south coast by the Likoni ferry. The coastal areas and beaches north and south of the city itself are often considered part of Mombasa. Both the north and south coast hold many of the great beach resorts that the area is famous for. 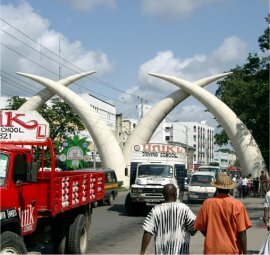 Mombasa's symbol is the elephant tuskes at the picture above. Besides all the nearby the beaches, there are some popular tourist spots that you should plan to check out. Fort Jesus and the Old Town neighborhood are the best-known destinations in Mombasa. They're both places of historical interest, which can be a nice change from all those wildlife safaris. The Malindi and Watamu Marine National Reserve parks are within a days drive of the city and can show you the native marine life up close and personal. There are land animals like monkeys, and monitor lizards at the parks too. The closest safari parks are the largest in Kenya and Mombasa is just a days drive away. The Tsavo East and Tsavo West National parks, located about 100km from Mombasa, are where you can find all the classic safari adventures and wildlife you would expect in Kenya. Mombasa is also close to the rain forest park of Shimba Hills. If you want to stay at a beach resort, you'll have to go either north or south of the city itself and there are more than enough to choose from. Here’s a my list of recommended beach resorts around Mombasa. Most are mid-range to high-end in terms of amenities and rates, but there are a few that would suit a modest budget. Staying right in the city is another option, and there are many hotels available in all price categories. They are much simpler than the lavish coastal resorts, with most of them within walking distance of various city sights. Unlike some parts of Kenya, Mombasa weather is very stable and is pretty reliable throughout the year. The rainy season is from April to June, with May being the wettest time to visit. It will rain about 20 days out of the month, in May. Aside from the rain, the average day temperature can range from highs of 31C in the warmer months, to highs of 27C in the cooler July and August. Flying in to Moi International Airport is the quicker option, though many flights coming in from Europe and elsewhere will require you to transfer in Nairobi first. Some chartered flights will go directly to Mombasa. Here’s more about flight connections to Kenya.